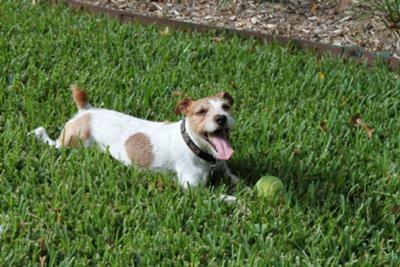 Kipp is a three year old Jack Russell that my fiance and I adopted June 1, 2009!!! I found him through pet-finder.com at Impact Animal Foundation, a local rescue organization where we live. We are the third owners of this sweet little dog and are still baffled that anyone would ever get rid of him. All we can come up with is that the previous owners could not deal with his high energy personality because he is great with other dogs, cats, and kids! He loves to run and play and requires a lot of exercise...his tennis ball and big blue beach ball are his favorite toys! A lot of people tell us that he is a lucky dog to have landed such a good home...but we are the lucky ones to have been blessed with a lovable family member!! !